This is a chiffon cake for my son’s birthday! Doraemon is one of the things he has likes and the only cartoon my hubby encourages as it’s in Chinese =p. The idea I had in mind was the flying Doraemon scene which I find super cute! 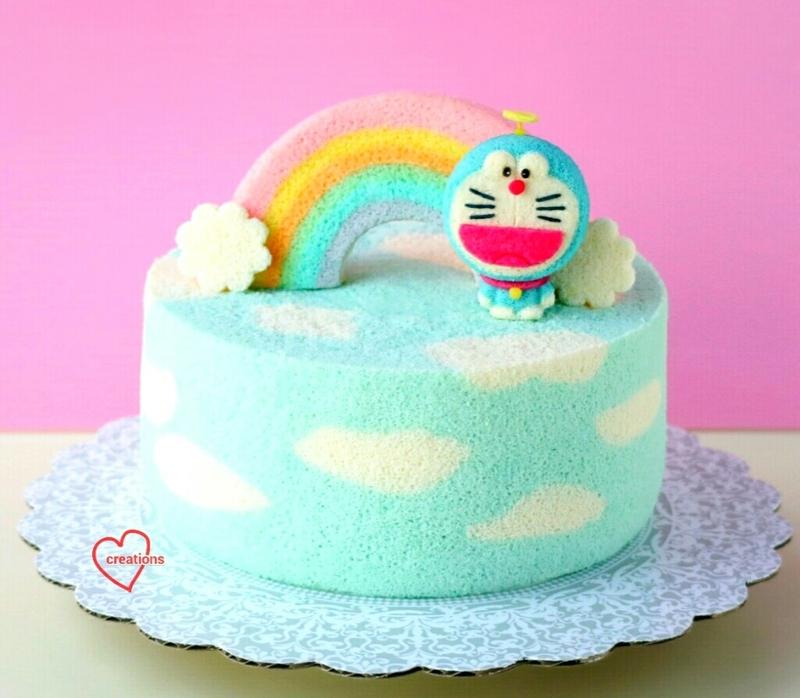 I made a chiffon flying Doraemon on a Rainbow-Cloud sky chiffon cake backdrop. The cloud backdrop was inspired by the cartoon and a dear friend. 3. Add in sieved flour and whisk till no trace of flour found. Divide the batter 2/3 and 1/3. To the 2/3 portion, add blue pea flower extract and a dip of blue gel food colouring (optional but brightens up the colour). To the 1/3 portion, add 5 g water. 5. Divide the meringue 2/3 and 1/3 for each coloured batter. Gently quickly fold in the meringue into respective batter in 3 additions. 6. Spoon the plain batter in cloud-like blobs at the base and sides of the pan, then fill the surrounding spaces with blue pea flower batter. Repeat till the batter is 2-cm from the brim. 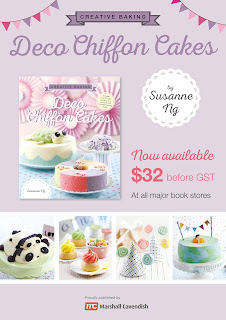 *The cake is a little similar to 'World map Chiffon Cake' (right most pic in collage below) from my 2nd book Deco Chiffon Cakes. 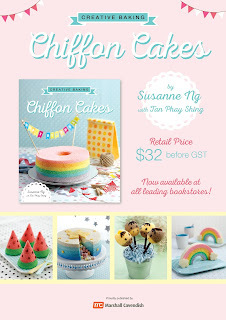 You may find the picture tutorials in the book useful for patterning the clouds in the chiffon cake. After unmoulding, I filled the centre hole with marshmallows surprise and covered it up with a circle cut out from leftover batter baked as sheet cake. 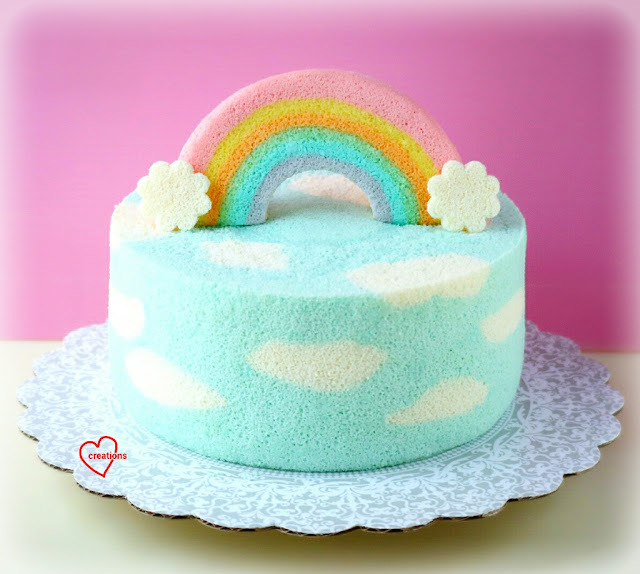 You may find the recipe for Chiffon Cake Rainbow (also right most pic in collage below) with picture tutorial in Creative baking: Chiffon Cakes (1st book). 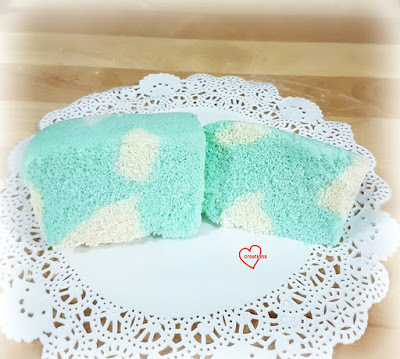 I piped on the face with chiffon batter in a Doraemon mold, then added the rest of the features using chiffon sheet cake cut-outs with marshmallow cream. 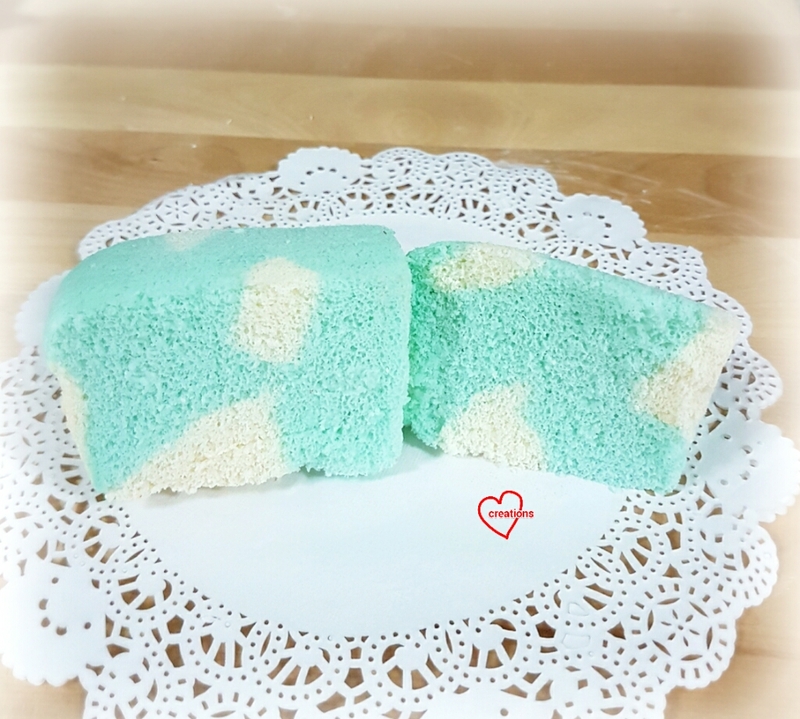 Here's a slice of my chiffon cake finally! Sorry it wasn't cut too beautifully as it was cut on the spot at the celebration using the blunt cake knife. Do you still bake and sell? I need a 1st birthday cake for my boy this coming sat, like the above Doraemon. How much do you sell?